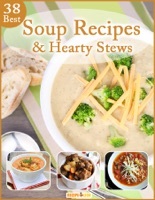 When you want something warm and comforting for dinner, soups and stews are sure to satisfy better than anything else. That’s why we gathered the best soups and stews together just for you in this wonderful collection. There’s something for everyone with these classic chicken soup recipes, vegetable soups, low-maintenance slow cooker soups, and super filling stews. You’ll find some new and unique soups to try, as well as easy versions of your old favorites. With the 38 Best Soup Recipes and Hearty Stews eCookbook, you’ll have plenty of ideas to get you through to the next change of season.